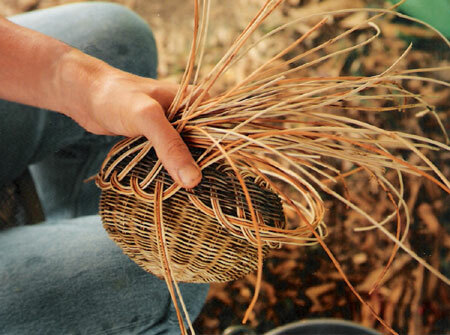 Traditional Honeysuckle baskets were made by the Cherokee People with a double weave technique that resulted in a seamless basket with two sides and a rounded rim. We will: prepare our own material from honey-suckle vine provided by Larry, dye the material with traditional dye stuffs, learn basket starts, add ribs in the traditional manner, turn down the inner part to weave the outer basket, and explore varied bottoms for finishing. Each student will complete a basket amid days of stories and laughter. Everything that goes into our baskets is organic, starting with hand gathered honeysuckle brought by Larry. Class will partake of the dying process, twisting a web of vines onto a coil and dunking it in a pot of boiling water. This strips away the outer sheath and leaves the core to bleach in the sun. To create the various colors, the fresh strips are simmered in a broth made from roots or nut shells, such as bloodroot, dyewood, and walnut hulls. This produces the beautiful shades of brown, orange and yellow traditionally used in these baskets. Using traditional tools, everything from a pocket knife to a deer antler, we twist the simple strands of honeysuckle into strong-as-steel vessels. Please feel free to call us about this workshop. We love to chat about our classes. 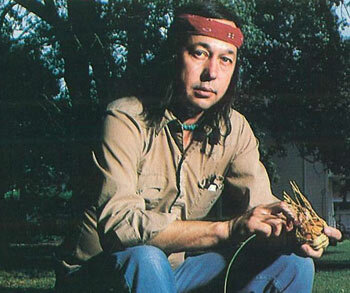 Larry is a member of the Cherokee Nation of Oklahoma and is descended from the Old settler Cherokees from Sautee, GA.  He is widely recognized for his expertise in basketry and has been honored by two Best in Show’s at the Five Civilized Tribes Museum at Muskogee, OK. He has won several awards at shows throughout the country, including several First Place awards at Santa Fe Indian Market. In addition to the honey-suckle baskets, he also makes them out of white-oak splints, buckbush, and miniatures from horse hair. Every morning, we start the day off with his fresh homemade traditional frybread !